There are countless areas throughout manufacturing and industrial environments which need to be cleaned regularly. However, many of these are tight, hard-to-reach or delicate spots, and regular cleaning tools are simply too large or cumbersome to do the job. For these reasons, many companies turn to foam-tipped applicators for precise, effective cleaning. 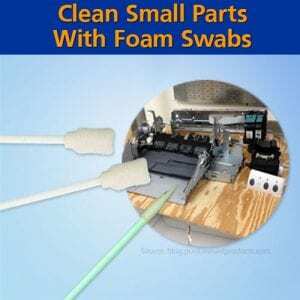 Foam swabs are the right tool for any jobs that demand precision, detailing, and cleanliness. The foam is soft and non-abrasive, making it safe for use on even your most sensitive manufacturing or industrial components. They’re also ideal for cleanroom use, as they feature thermal bonding to prevent contamination. While foam applicators are soft enough for gentle cleaning, they’re still sturdy enough to avoid bending, flexing, and folding during regular use. They can be used either wet or dry. With many different configurations available, there’s a specific swab available to meet the needs of any application. Some industries that can benefit from foam-tipped applicators include printing, precision manufacturing, electronics, semiconductors, aerospace, pharmaceuticals, and biotechnology. Below, we’ll discuss some of the many of the general purposes these swabs are used for. When you need to precisely apply cleaning solvents, adhesives, paints, or lubricants, a regular cleaning cloth won’t do. Foam swabs like the Puritan foam-tipped applicator or the CleanTex Large Foam Swab have an open-cell structure which creates an optimal holding capacity, making it easier for you to perform precise cleanings and applications. They’re also free of adhesives and shred-resistant to keep contaminants away from small machine components. Small, grooved areas in fiber optics can benefit from non-abrasive foam applicators like the TekniSwab cleanroom foam swab or the Chemtronics Foam Flextip Swab. With a conical screw tip, the applicator can successfully remove buildup and excess production material from extremely tight spaces. Virtually any industrial or manufacturing setting has surfaces and components that need to be cleaned regularly for optimal efficiency. 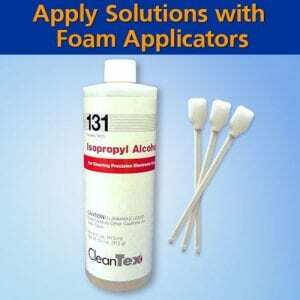 Chemtronics Foamtips Swabs are lint-free and non-abrasive; perfect for cleaning. In the manufacturing of electronic components, for instance, few particles can be present during critical phases of production, and even the presence of static could compromise your products. To limit contaminants and control static in these environments, swabs like the Puritan anti-static foam swab are a leading choice. During the production and handling of flat-panels and circuit boards, small components like the interiors of orifices and tubes must be cleaned. Because they are inaccessible by larger cleaning instruments, foam-tipped swabs are often the go-to cleaning tool for these minute spaces. In industries like aerospace, employees may handle coated lenses regularly. To perform a thorough surface cleaning without impacting the lens coating, you’ll need to use a nonabrasive foam tip. They’re also useful for cleaning small mirrored surfaces and fiber-optic sensors. Before devices produced in semi-conductor manufacturing can be sealed, their O-ring chambers must be cleaned. Many manufacturers turn to static-free foam-tip swabs to perform the task safely and efficiently. 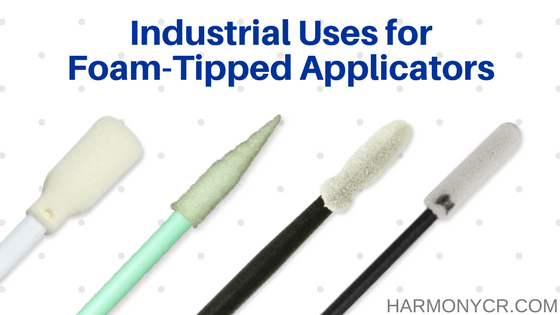 No matter your needs, Harmony Business Supplies has dozens of foam tip applicators to help you maintain a clean, sanitary work environment. To explore their options, browse through our swabs online now or get in touch with a product specialist today.